Foreigners may soon be banned from Dutch coffee shops where cannabis is readily available. (CNN) -- The Netherlands plans to ban foreigners from the country's famed pot shops, a decision Amsterdam's tourism industry hopes goes up in smoke. The Dutch Cabinet late last month said the measure was needed to "reduce nuisance and drugs tourism," arguing that "substance use of minors has to be countered more strongly and that coffee shops have grown into large points of sale of cannabis that are hard to manage." 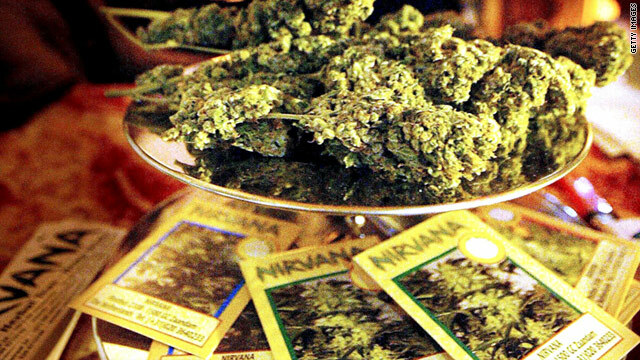 Known as the "Weed Pass," the measure will turn coffee shops into private clubs for Dutch citizens over the age of 18. The memberships will last for a minimum of a year, and each shop will have a capped number of members. "Persons who do not hold Dutch citizenship will not have access to the coffee shops," the Dutch Ministry of Security and Justice said in a statement. "The Cabinet expects that closure of coffee shops to foreign drugs tourists will ensure that they no longer travel to the Netherlands to purchase and consume cannabis. After all, many of them can use the illegal markets available in their immediate surroundings," it says. The government said the measure also is needed to crack down on drug trafficking near the borders with Germany and Belgium. "The number of criminal organizations that will be dealt with will be doubled from 20 to 40%," the Ministry of Security and Justice said in its statement. But even in announcing the tougher stand, the government said Dutch drug use has "remained more or less stable in the past decade." Under the current plan, the measure will go into effect this year in the southern part of the country, and then for the rest of the country in 2012. The city of Amsterdam, including its mayor, has vowed to fight the measure. "The Dutch government has decided upon this for the whole of the Netherlands. Amsterdam doesn't want it," said Machteld Ligtvoet, a spokeswoman for the Amsterdam Tourism & Convention Board. Ligtvoet added, "Coffee shops are not actively promoted by our organization and are not used in order to attract tourists. However, the mere idea that one can buy and use soft drugs here is an attractive aspect of Amsterdam and its famous spirit of freedom." The Amsterdam Tourism & Convention Board says the new measure should be dismissed because it discriminates against foreigners. The board also says it fears "soft drugs will be sold on the street again, leading to more crime and dangerous situations." The Netherlands is renowned for its coffee shops where anyone over the age of 18 can freely walk in and peruse a menu of marijuana and hashish delicacies. Customers can purchase up to 5g of cannabis, and it can be smoked in regular joint fashion, as well as by bong and pipes. Alcohol is strictly prohibited in the shops. Twenty-three percent of Amsterdam tourists say they visit coffee shops during their stays, according to the Amsterdam Tourism & Convention Board. "These tourists are an important (though not most important) economic factor of Amsterdam." HIGH TIMES magazine has sponsored the Cannabis Cup for the past 24 years in Amsterdam, bringing together thousands of marijuana and hashish enthusiasts in the city known as the "Mecca of Pot." This year's Cannabis Cup is slated for November 20-24 and is not affected by the new measure. But the ban could affect next year's event. "As a result, HIGH TIMES is encouraging all who've always wanted to attend the Cannabis Cup and visit Amsterdam to do so this year," the magazine says on its website.